China no longer wants to be content with its supercomputer developed by its engineers in 2016. China no longer wants to be content with its supercomputer developed by its engineers in November 2016. Chinese scientists have managed to create a quantum computer that goes well beyond known borders. In China, the production of electronic chips has grown at a furious pace, putting the Chinese economic war machine on the roof of the computer world. With the Sunway TaihuLight (power of the sun in French) with a power of 93 petaflops (up to 125 petaflops), China has taken a new step by developing the fastest quantum computer of all time. In 2001, China created its first commercial electronic chip, precisely three decades after Intel, which in 1971 unveiled the very first microprocessor ever created, the 4004. And it can be said that the Middle Kingdom has brilliantly managed to catch up. The TaihuLight is almost three times more powerful than the previous champion, who was also Chinese, the Tianhe-2. China now trustees the top two places in the world supercomputers. According to quantum physicist Pan Jianwei, a professor at the University of Science and Technology of China (USTC) and director of research, quantum computers can, in principle, solve some problems faster than conventional computers. Although the progress of the last two decades has been significant in this area, the construction of quantum machines capable of outperforming conventional computers in certain tasks remains a major challenge. Many American companies have also embarked on the adventure of quantum computing, as Google in 2015 unveiled in partnership with NASA its own intelligent machine. Other heavyweights like IBM, Microsoft or Intel are also developing their supercomputer. The novelty with this type of computer would, to give an image, its ability to read several books simultaneously, when a traditional computer can read only one book at a time. The phenomenal amount of computing that these computers can do at a glance helps manage incredibly complicated data, such as changing weather conditions around the globe, over months, years, and even decades. Of course, the existence of such a powerful machine fuels jealousy and lust, and that is why the government has put in place a policy of protection and confidentiality drastic. 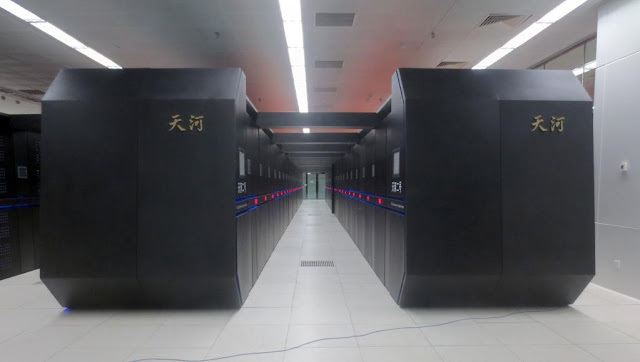 In fact, according to the BBC , all the components of the computer are manufactured locally, at the "National Supercomputing Center" of Wuxi, just a few kilometers from Shanghai. With its supercomputer, the Sunway TaihuLight, the country is showing its willingness to be self-sufficient in terms of high technology. The government even aims to equip PCs and smartphones made in its own territory with some of the essential technologies of this new quantum computer. For now, only the prototype of this great tool is complete. The BBC was the only media allowed to make a video report for its series titled "Tales of Modern China".